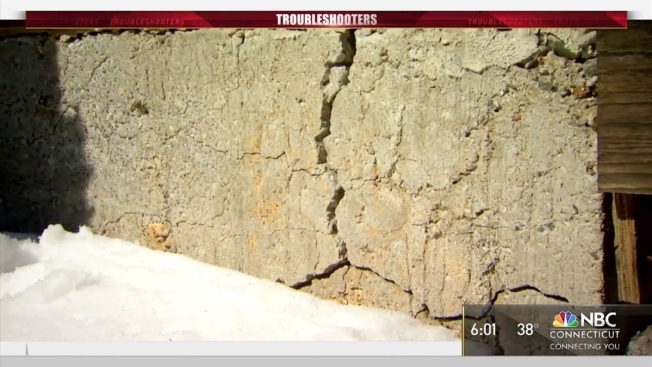 Since the NBC Connecticut Troubleshooters broke the crumbling foundations story in July of 2015, the focus has been on the financial burden plaguing hundreds of homeowners in Hartford, Tolland and Windham Counties. Now our investigation has revealed that several commercial buildings are showing signs of the concrete issue as well. Glen Johnson has built his life around his Tolland auto repair business. He put up the building nearly 30 years ago, but started noticing cracks in 2010 that have grown progressively worse over time. "This whole section around the corner is so bad you could probably use screwdriver and pop that piece out of there," says Johnson. A structural engineer has confirmed Glen has the same crumbling foundation issues shared by hundreds of homeowners across eastern Connecticut. As far as Glen is concerned, he has no choice but to keep moving forward. "We have three guys in the shop full time, so my livelihood is their livelihood too. However we do it, I just can't stop my business and put a new building up, it can't happen that way. Somehow these guys need to keep getting a paycheck," says Johnson. Beth Horr's dance studio sits on a crumbling foundation as well. Over the years, she says she's invested countless hours and tens of thousands of dollars to build and improve her business step by step. Now, she's worried about what comes next. "If they came in and said we have to leave the building... that would be hard," she says. The NBC Connecticut Troubleshooters also found telltale map cracking at the historic Somers Inn, now called the Black Horse Tavern. The owner tells the Troubleshooters he's aware of the issue, but has yet to do anything about it. The question now is whether commercial property owners will be included in any program that provides money for crumbling concrete. Johnson and Horr are hopeful, but not optimistic. "Is the State of Connecticut gonna help us? I don't know. If I could get some assistance; I'm not looking for a hand out, a new building for nothing, I'm willing to pay for it, but I need help getting that money," says Johnson. "If I have to pay for this then all my funds would go and that's a huge problem," says Horr. We reached out to state lawmakers from both sides of the aisle who say they don't think commercial properties will be included in the proposed Senate Bill 806, that would create a "Crumbling Foundations Assistance Fund". They would likely tackle that aspect the problem in the 2018 legislative session. Meanwhile, elected officials in several eastern Connecticut towns have expressed concern about some of their municipal buildings. They say none of the buildings is showing signs of deterioration, but we confirmed with the general contractor of at least three town buildings built in the early 2000s that the concrete used is from the same supplier the state says is the likely source of the foundation problem.